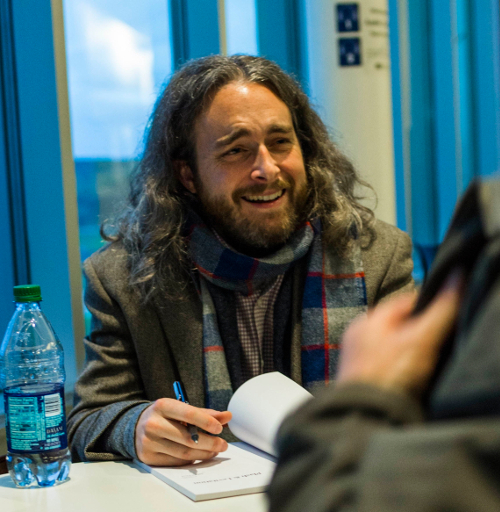 Adam Tavel is the author of Plash & Levitation (U of Alaska P, 2015), winner of the Permafrost Book Prize in Poetry, and The Fawn Abyss (Salmon Poetry, 2016). His recent poems appear, or will soon appear, in Poetry Daily, Oxford Poetry, Crazyhorse, Copper Nickel, Meridian, Southwest Review, Ecotone, The Gettysburg Review, and Quarter After Eight, among others. He is a professor of English at Wor-Wic Community College and the reviews editor for Plume. You can find him online here. galleried behind our solemn kneeling. draped across her hands like a stillborn lamb. which was our cue to fix our hair and stand. His chalice brimmed with crumbs to feed us all. petting it like a blind kitten.